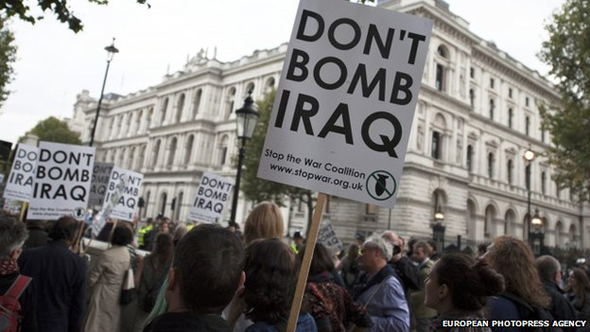 MPs will vote later on whether the UK should join US-led air strikes on Islamic State (IS) in Iraq. The Tories, Liberal Democrats and Labour all back action, which the coalition says is legal because it was requested by the Iraqi government. In an interview with political magazine The House, Defence Secretary Michael Fallon said the campaign could be a "long haul" of "two to three years". IS has seized large parts of Iraq and Syria in recent months. The group, also known as Isis or Isil, has used tactics that have included beheadings of soldiers, Western journalists and aid workers. It could have as many as 31,000 fighters in Iraq and Syria, according to the CIA. 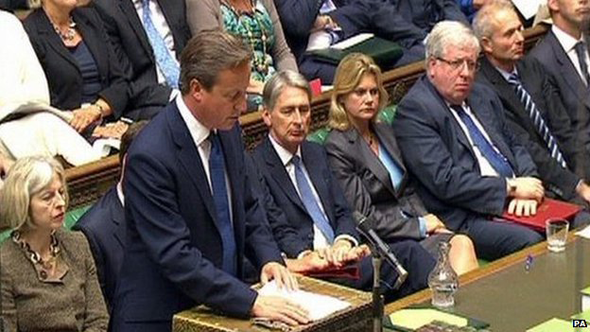 The UK government is not proposing any involvement in air strikes on Syria. On Thursday, about 250 people protested outside the gates of Downing Street against the possibility of military action in Iraq. Some MPs also oppose the military action. Labour's Diane Abbott, Jeremy Corbyn and John McDonnell signed a letter to the Guardian which said bombing Iraq would "only exacerbate the situation". "We urge the government to rule out any further military action in Iraq or Syria," they said. The Commons has been recalled from its four-week break for the Scottish independence referendum and party conferences to deal with the developing situation. Prime Minister David Cameron will open the debate at 10:30 BST (09:30 GMT) - it is expected to last seven hours. The government does not have to seek the approval of MPs to commence military action, but it has become customary to do so since this first happened over the Iraq war in 2003. Six RAF Tornados in Cyprus have been ready to carry out air strikes for weeks. Their laser-guided bombs and missiles will be loaded and armed soon after Parliament gives the green light. The Tornados have already been flying reconnaissance missions over Iraq and will have identified potential targets. But some of the obvious ones, like command and control centres, will have already been hit by US war planes which have been launching strikes for the past month. The focus of their attacks have now switched to Syria itself. So the RAF will also be looking for targets of opportunity - such as IS fighters and vehicles on the move. The expected intervention of the UK will not be a game-changer. During military intervention against Libya in 2011, the RAF had three times as many war planes involved. But the fight against IS will be more like a marathon than a sprint. And the longer it goes on, IS will adapt its tactics, and airstrikes will inevitably become less potent. Its motion specifically rules out any attacks on IS in Syria, following the Commons' rejection of joining in air strikes in that country last year. Any action there would require a separate vote. Downing Street said UK forces could join the bombing of targets in Iraq after the Iraqi minister of foreign affairs wrote to the United Nations seeking international assistance. Foreign Secretary Philip Hammond reiterated on Thursday that any ground campaign against IS would not involve UK troops. The US began a series of air strikes in Iraq last month, and on Monday it began attacks on targets in Syria. Pentagon spokesman Rear Admiral John Kirby said the purpose of the Syria strikes was "not necessarily to kill militants" but to destroy the facilities - including oil refineries - which were funding IS through the black market. Jets from Saudi Arabia and the United Arab Emirates have joined US forces in the attacks, and the US says more than 40 countries have offered to join the anti-IS coalition. IS has threatened to kill British hostage Alan Henning, whose wife pleaded for his release on Tuesday. The threat was made in a video showing the beheading of British aid worker David Haines earlier this month. Mr Haines's daughter, Bethany, has told ITV News IS must be "eradicated". Also on Tuesday, IS released a second video showing UK journalist John Cantlie. Meanwhile, in the US, FBI director James Corney says the bureau has identified the man referred to in the British press as "Jihadi John". BBC security correspondent Gordon Corera said UK security services were frustrated at the FBI comments. He said UK authorities "may well" have known the suspect's identity for weeks, but they wanted to gather as much intelligence as possible without "tipping their hand as to what they knew". When David Cameron stands up at the dispatch box to open the debate about military action he will know that the result of the Commons vote is not in doubt. We are not about to see a repeat of the scenes at the end of August last year when a government's proposal to consider military action against Syria was rejected at the end of another emergency debate. This time there's agreement between the three largest parties at Westminster, but that doesn't mean there won't be a real debate. Some MPs are opposed to military action and will argue and vote against the motion. That motion spells out that the Commons is not being asked to endorse air strikes in Syria and we can expect questions and concerns about what would happen in the future. The suspected militant - whom the FBI is not naming at present - is thought to have appeared in IS beheading videos. Speaking at the UN in New York on Wednesday evening (Thursday morning UK time), Mr Cameron said countries must stop their citizens travelling to join jihadist groups. The EU's anti-terrorism chief, Gilles de Kerchove, has said more than 3,000 Europeans have joined Islamist fighters in Syria and Iraq, and Mr Cameron said 500 Britons had joined IS. These apparently included Ibrahim Kamara, 19, from Brighton, whose mother Khadijah told the BBC her son had been killed in a US air strike in Syria on Monday. She said her son, who had apparently joined al-Qaeda affiliate group Jabhat al-Nusra, had been "brainwashed". Amer Deghayes, from Brighton, said he travelled to Syria with Ibrahim Kamara to join Jabhat al-Nusra. Speaking to BBC Newsnight from Syria, Mr Deghayes said Mr Kamara was "soft-hearted" and a "funny guy" who wanted to help people. "He was just a normal Muslim lad," he said. "He learned about his duty towards the people that are being oppressed, people that are being attacked because they're Muslims and he saw that the solution is jihad." Mr Deghayes said he understood why his friend's family were upset, but said Mr Kamara had been granted a "honour" by Allah. "Ibrahim has always been a person that asked for martyrdom," he said. He said if the family did not "understand", it was because they did not have "the knowledge of the virtues of jihad and the virtues of martyrdom". Mr Deghayes said he was friends with at least three other British fighters who were killed in Monday's air strikes, but he refused to reveal their identities.